Over the sunny weekend, Chicago played host to one of the largest triathlons in the country, where thousands of top athletes took over the streets of Chicago and Lake Michigan to complete a rigorous day of running, swimming, and biking. 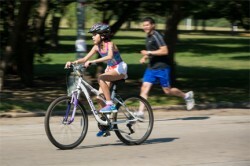 Among the athletes was Logan Square resident Jorge Martinez, 41, who was accompanied alongside his 11 year-old daughter, Daniela Martinez, who competed in the Life Time Kids Triathlon. It was Daniela’s first time competing in a triathlon. For more than three decades, experienced triathletes and determined newcomers have participated in Life Time Tri Chicago, an action-packed tour around Chicago, which offers courses for kids and top athletes. Nearly 9,000 pro, elite amateur and first-time triathletes competed and more than 15,000 spectators attended the weekend’s events. © 2008 Chicago Hispanic Newspaper, Lawndale News, Hispanic Bilingual Newspapers, Su Noticiero Bilingue. All rights reserved. XHTML / CSS Valid.